An essential factor to get excellent coffee is freshness. Oxygen is an oxidizing agent for coffee, so in order to maintain our standards of freshness, we pack up all the beans in bags, once they have been removed from the toaster. The bags are provided with a special valve that ensures the elimination of air. By using these bags, grains remain as fresh as they were the day they were fried for up to 12 months. We recommend that unused fresh coffee, should be stored in closed containers, in dry and cool places. Glass is the best choice because it does not retain odors or oils from a previous use. Extreme temperatures (too cold or too hot). Strong odors (coffee attracts and absorbs foreign odors). Do not freeze or refrigerate coffee. Buy fresh coffee beans and use them within 2 weeks for a perfect taste. We recommend buying coffee on a weekly basis and grinding the coffee beans just before preparation, as ground coffee loses its flavor immediately, no matter how it is stored. Beans keep their freshness longer than ground coffee. However it is recommended that the process of grinding coffee is made closer to the time of preparation. Make sure the coffee is fresh from the beginning. The pleasure of preparing coffee is a personal and sensual experience. There are different ways to prepare a delicious cup of coffee, but the secret to getting the perfect cup is to prepare it according to your taste. If the results did not meet your expectations, try again. 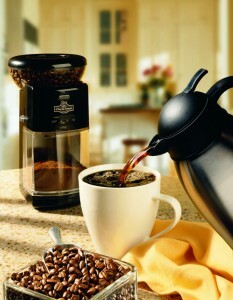 Grind a bigger or a smaller quantity of coffee, use more or less water, purchase and estimate the varieties of coffee. We recommend some basic rules to guide you correctly before experiencing the process of preparing coffee. The art of preparing an exceptional cup of coffee. 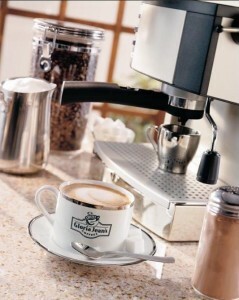 Use only Arabica beans of the highest quality. 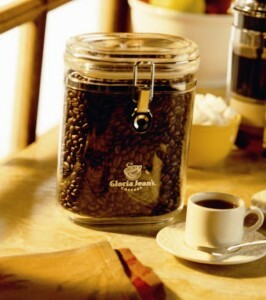 Gloria Jean’s only uses Arabica beans carefully selected worldwide. Use a clean coffee filter. Oily accumulations can make your coffee bitter, so your machine must be cleaned regularly. Use freshly ground coffee. Whenever possible, buy Gloria Jean’s favorite coffee in small quantities. Grind coffee before preparing it just like we do at Gloria Jean’s to ensure maximum freshness (ground coffee loses its flavor and strength). Match your grinding process with your coffee preparation system. It is essential that the beans are properly ground in order to suit your filter. In general, the more the water and the coffee are in contact during the preparation process, the more coarsely ground the coffee should be. For instance, for a French press coffee grinder, the coffee must be coarsely ground because the preparation time is 4 minutes. 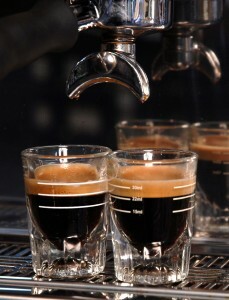 For an espresso, the boiling process takes only a few seconds, so you need finer coffee. Always use fresh, cold water, brought to a boil. Filtered, bottled water is best. Don’t use distilled or softened water as this will affect the coffee aroma. To reach the perfect water temperature, boil the water and then let it cool a few seconds. If you let it cool longer than a few seconds, the water won’t capture the flavor of the coffee beans. Cooked or reheated coffee will lose its flavor. Use the correct coffee water ratio. We recommend using a spoon of ground coffee (10g) to 180 ml of water. Use the right amount of coffee to suit your taste. Drink freshly brewed coffee. If you prepare more coffee than you can drink at that point, it is generally recommended to put the remaining coffee in a thermal pot. It can be left for one hour without changing its taste. The coffee is too weak and cold until that second cup of coffee is served. Filter coffee left on the hot plate becomes too bitter and tasteless. Never reheat cold coffee. Appreciate the coffee for its taste. If it’s too strong or too weak, adjust the coffee grinder or the amount of water until you get the perfect cup of coffee, one that will satisfy you. Species of coffee shrubs that produce Arabica coffee beans. These shrubs grow best at high altitudes (between 1,220 and 1,830 meters above sea level). Arabica beans are used by professionals and cafes, and are considered by most of those who sell it, the finest and best coffee. Many of the types of fine coffee are grown at high altitudes. Plants grown at higher altitudes mature more slowly and give beans a more concentrated and intense flavor. Coffee tasting or coffee cupping, is the practice of observing the degree of roasting, flavor, acidity, viscosity, and other characteristics. The part of the coffee beans that are just beneath the flesh, and are eliminated during the processing of coffee. A mixture of coffee beans. Usually the beans are medium roasted to well fried, depending on the person roasting the coffee. He who cooks the coffee or the café specialist sells what they call an “espresso blend” or “espresso roast.” Although an espresso blend or an espresso roast can be prepared by any method (such as the strainer or filter) it is advisable to prepare it in an espresso machine. Coffee cultivation: beans are grown on a single plantation. The grower carefully looks after the beans because he is more concerned about the taste and quality of coffee than about the money that he will get in return for it. Refers to the distinctive taste of coffee. It may be perceived during coffee tasting. It is a classification system used to separate the beans, depending on their size. Larger grains are more expensive. However, the size of coffee beans doesn’t directly influence its taste. Usually the size of specialty coffee beans is 15-19 (size expressed in units equivalent to 0.04 cm). A single variety or a single origin of the coffee beans, different from a mixture of coffee.